Madison is known for its numerous nonprofit organizations that serve virtually every need in the community. But, they don’t escape criticism from some quarters who believe that they ought to be collaborating more and sharing precious resources so they can reduce overheads and commit more of their money to their actual causes. Some have heeded the criticism and made remarkable strides to share costs and help them make do in a continuing struggling economy. Two nonprofits that dealt with helping the homeless find shelter and employment—Transitional Housing Inc. and Community Housing and Services—merged to become Porchlight, now considered a shining example of how to deal with homelessness. Meanwhile, several organizations that work with trouble youngsters and their families—Briarpatch, Project HUGS, Street Outreach—joined under the umbrella of Youth Services of Southern Wisconsin which has enabled them to not only more efficiently run programs here in Madison, but branch out to other communities. Those were just two starts. Now come this Wednesday afternoon, Community Shares of Wisconsin, will unveil its new Center for Change with an open house from 4 to 6 p.m. 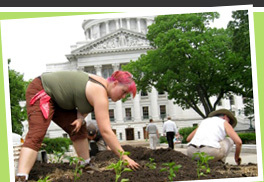 The center not only houses Community Shares, which supports some 63 member organizations through its annual payroll deduction campaign, but is home to ACLU of Wisconsin Foundation, the League of Women Voters of Wisconsin, the Wisconsin Nonprofits Association, BadgerStat and the Wisconsin Women’s Network. The six nonprofits will share networking, learning resources and volunteers’ time, plus give them the opportunity to share ideas on how to achieve social change. Other benefits include two UW-Madison partnerships that are currently coordinated by Community Shares—the “Madison Commons,” a project of the School of Journalism, and the Morgridge Center’s annual volunteer fair. The 612 W. Main Street address has a long Madison history. It was built in 1929 by the Heilprin family for its Whole Produce Co. It’s called the “Sunkist Building” because of its Sunkist logo on the structure’s east side. The current owner, Delta Properties, partnered with Community Shares to design and construct the Center for Change. Wednesday’s open house, to which the public is invited, will include food and beverages courtesy of neighboring businesses, Eight Seasons Grille and Capitol Centre Market. Local businesses that helped support the center include Wegner LLP, First Business Financial Services, M3 Insurance Solutions for Business, MG&E Foundation, Scholz Nonprofit Law, Katz Family Foundation and Delta Properties.